So, fresh back from Tijuana, Mexico with some of my high school students has got me thinking about the roles of fear and inconvenience in our lives for the sake of community in general, but also for marriage. 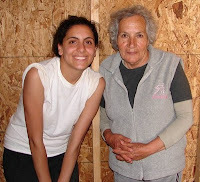 On Tuesday, our group got to build a house for a sweet, elderly woman named Maria (on right with one of our group members). She had taken the bus to meet us at the mission where we were saying and because of that, couldn't remember how to get back to where her new house would be built. We drove around, stopping twice for her to jump out and ask for directions and the second time really challenged our groups thinking about community. We had stopped at a barber shop where she jumped out and talked to a man outside. He explained directions to her and then came up to our van and explained them to me - I speak very little Spanish though and had NO IDEA what he said and simply smiled, nodded my head and said "Si." 1) First, either party would always assume the worst about the other. We would hesitate to let a person jump in our car or offer to jump in someone else's car just to help with directions. The thought would be that it would be too dangerous, too much of a risk and just plain stupid. We'd rather drive around frustrated and lost than take the risk of letting a person in our cars. 2) Second, how many people are willing to just stop what they are doing and give up an hour of their time to help someone else? Most of us are too busy and too concerned with whatever we are doing to do this. With a holy sense of irony, the speaker the next morning ended up speaking about this idea in his talk exclaiming that, "If we want to have true community in our lives, we have to allow ourselves to be inconvenienced. God uses people to reach people and all too often we let so many things get in the way of this." First, within a healthy marriage, there needs to be give give and take. There needs to be sacrifice on the part of both spouses for the other. This really is the definition of being inconvenienced. Being put into a spot or a situation that would not suit your needs or your desires but someone else's. It is never an easy thing to do but it is in these moments that not only help strengthen a marriage but also strengthen ourselves as individuals. Second, we have learned that a big part of growing in marriage is being willing to admit our own failures and struggles to others. Sometimes, we have to be willing to stop and ask for directions. And then, we have to be willing to let someone jump in the car with us and help us get to where we need to go. What are people going to think of us? What if we're the only one's dealing with it? People will think we are crazy? We've thought these questions before ourselves. But we can also tell you that when we have gotten past them and opened up to a friend, pastor, counselor or another party we have been met with compassion and got the advice and help we really needed. It's a humbling thing to open up to others but, alas, God uses people to reach people. Third, flipping around the previous thought and back to the issue of being inconvenienced, as we grow in our own marriages we must be willing to be there for others who are struggling. We have to be willing to be interrupted and stop what we're doing to hop in the car with others and help them find their way. Have you ever noticed that the times where your friend is having a crisis and needs to talk are hardly ever good times for us. Those times interrupt our meals, our down time, and our time with our family. Being willing to be that listening ear, offer advice and challenge one another in our marriages is crucial to them being able to survive. God uses people to reach people. God uses spouses to help spouses. God uses marriages to help marriages. 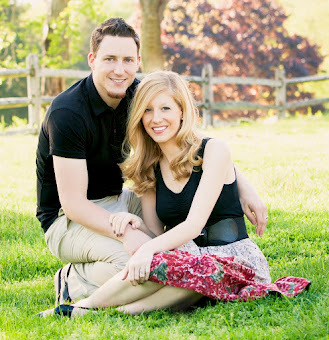 How much are you willing to be inconvenienced by your spouse? By others? Are you dealing with an issue you are scared to get help with? Why? Is there a line between being inconvenienced and being walked over?